Cream biscuits are a family favorite. These cream biscuits are so light and fluffy and good. Your family will love them! They are easy to make and with only 3 ingredients you can’t beat this recipe. Perfect with butter and jelly for breakfast with your morning coffee or make them for any meal. These biscuits are so easy you will make them over and over again. Cream biscuits are so good that children and adults will love them. Make above into a dough, roll out to 1/2 inch thick, cut out with cutter. Place on sprayed baking sheet leaving 1 inch between biscuits. Bake in preheated 450 degree oven for 10 to 12 minutes until golden brown. Checking for doneness as oven temperatures vary. Makes 10 to 12 depending on size you cut them. Enjoy! These cream biscuits are so light and fluffy and good. Your family will love them! Make above into a dough, roll out to 1/2 inch thick, cut out with cutter. Place on sprayed baking sheet leaving 1 inch between biscuits. Bake in preheated 450 degree oven for 10 to 12 minutes until golden brown. Checking for doneness as ovens temperatures vary. Makes 10 to 12 depending on size you cut them. 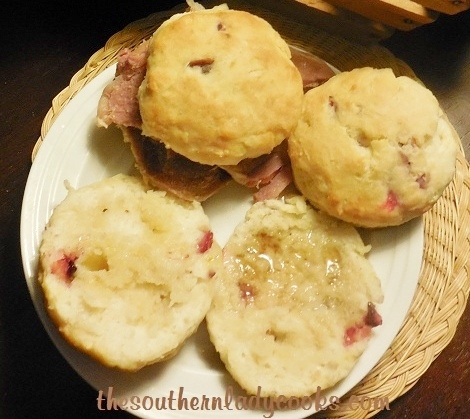 If you love biscuits be sure and check out The Southern Biscuit Ebook! With over 40 wonderful biscuit recipes that will download right to you computer, you will become a biscuit expert. I made these this morning. They were beautiful, fluffy biscuits but fell apart. They were okay for gravy but couldn’t butter them or put sausage between them. What can I do to make them hold together better? They are not sweet and taste great! Maybe try kneading your dough a little Ann. I have not had this problem with these as you can see in the photo. Also, maybe cook a little less time. I am going to try this recipe sounds so easy I love butter biscuits with a slice of tomato. It’s best to use self-rising flour. No Sandi, I don’t think they are sweet at all. I just took these out of the oven…they are superb! I didn’t have any self-rising flour so I just made some myself by adding baking powder and salt to all-purpose. Love these! I’m going to try these this week is there no kind of shortening or oil or lard in them? What makes them rise? No, Shawn, there is no shortening or oil or lard. I made these this morning and I cut the sugar to 1 teaspoon and the cream to 1 cup. Mixed it with a spoon and my hands and it seemed to me they rose even higher this way. I could tell no difference in the taste by using less milk and sugar. There is so much butter in the whipping cream that’s why you don’t need to add anything else. (There are videos on how to make butter from whipping cream.) I’ve been making these biscuits for a long time. So quick and easy. I think you might enjoy them. These look beautiful and so simple! I’ll have to try these. thanks for a great recipe! I could eat that whole basket! Those look wonderful. And I like that there’s just a little sugar in the mix.